What is an Investment Grade Classic Automobile? At the recent Pebble Beach Concours d’Elegance, the premier vintage automobile showcase in North America, the prestigious RM Auction was held. RM, both an auction company and an automobile restoration firm based in London, sold 14 cars for over $1 million. Of these, six were Ferrari and six were Mercedes Benz. The Ferrari’s totaled just over $17 million and the Mercedes passed $25 million. (CNN) December 3, 2013 -- If investing in credit default swaps or commodity derivatives doesn't exactly fill your heart with a sense of wonder and excitement, then a product with a little more va-va-voom could be a surprisingly viable alternative: vintage cars. Records have been tumbling recently for classic cars sold at auction. Last week, a 1964 Ferrari went for $14.4 million at the "Art of the Automobile" sale, smashing the previous record of $6.9 million for the same model. Sotheby's sold off 31 classic and concept cars and auto-related items for nearly $63 million in just over two hours at the auction in New York City. Over the past decade the average value of classic cars has risen by 430%, according to Knight Frank's Luxury Investment Index. This compares to 273% for gold and a comparatively meager 55% for the FTSE 100 over the same time period. Indeed, in only July a 1954 Mercedes-Benz was snapped up for $29.6 million, the highest price for any car ever sold at a public auction -- dwarfing the previous title-holder by $13.3 million. And just yesterday, Ringo Starr's 164 Facel Vegal was auctioned off for a cool $553,000 alongside a host of historic cars at Bonham's, during a series of lots that netted the auction house a cool $27.6 million of sales. "The fact that a car was previously owned by a celebrity will more often than not push the value up, but of course it depends on who the celebrity is" said Bonham's spokesperson Chloe Ashby. "The demand for vintage cars is rising," she added. "Along with jewelry and Asian art, cars are now in the top three collecting categories." Dietrich Hatlapa is founder of the Historical Automobile Group, an independent investment research house that specializes in classic cars. He says that vintage motors offer a unique appeal, particularly in the wake of the financial crisis. "People have been more drawn to tangible assets over the last 10 years. Classic cars are fun, you can drive them and they have become a lifestyle as well. It's also a way to pass on wealth from one generation to the next." The value of classic cars has jumped 39% this year alone, according to the Historic Automobile Group Index (HAGI), which tracks the financial performance of 50 rare and exotic classic cars. However, there is a sense among industry experts that these growth trends will slow down. "I would be surprised if the demand and value can continue at the same rate over the next 10 years," said Andrew Shirley, editor of theWealth Report. There are also risks to investing in vintage cars, as opposed to the more conventional alternatives, like bonds. "The big difference to mainstream investment options is the lack of liquidity. You can't sell your car next door," Shirley said. "It will take a lot of research and a long time to find someone to sell your car to for the right price. There are also slight fluctuations in trends, so it might be that at that time an Aston Martin isn't as much in demand as a Ferrari." It's also not a one-off investment -- there can be substantive costs involved in maintaining the car. "You have to look after them to keep them in good condition, especially if you want to keep driving," Shirley said. Accordingly, Hatlapa advises against throwing your money at a classic car if money is all you're hoping for in return. "Someone shouldn't go into the vintage car market for pure investment purposes, but have a passion for classic cars," he said. "The most valuable return from owning a vintage car is the satisfaction that you have something you're passionate about." 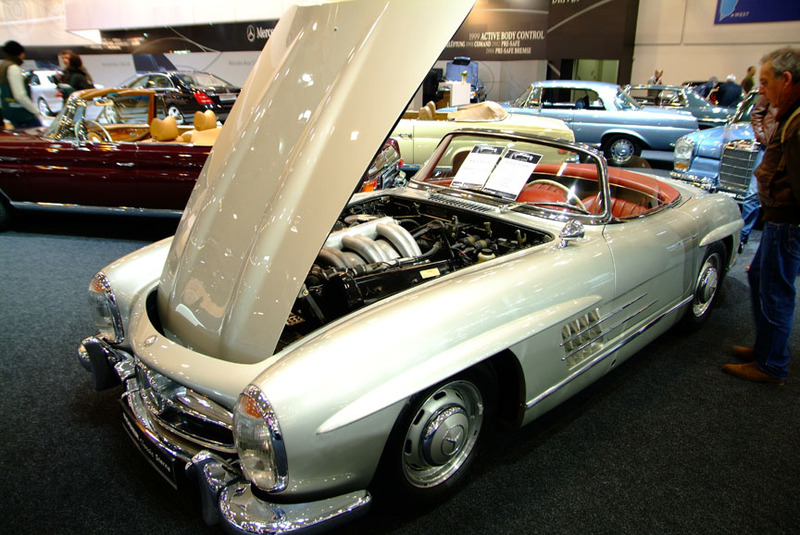 Passarelli Restorations has been watching the values of classic Mercedes Benz on more than one continent. This month, at the Techno Classica in Essen, we have seen the values equaling and even exceeding those we have been seeing in the North American market. This nicely restored roadster (left) was offered at $960,000 USD. What was very surprising was a roadster being offered at $750,000 USD that was in extremely rough, non-drivable condition. If you are in the market for a classic Benz, NOW is the time to buy. There is almost no such thing as paying a premium price in the foreseeable future as all the selling markets are continuing to see an increase. If you are uncertain of a cars value, please feel free to contact us at Passarelli Restorations. We offer inspection and appraisal services, and can provide you with the informed advice you need to make the investment decision that classic Mercedes Benz purchases have become. Here it is, more evidence of the ever increasing values of classic Mercedes Benz. Who would have thought just a couple years ago that an offer of $910,000 for a Gullwing would be considered too low? Well, who besides Mark Passarelli. If you are looking for a secure investment, feel free to contact us! The rudge-wheeled 300SL at left sold for $1.5 million on January 18th at Scottsdale. We don’t want to keep saying the same thing just to prove ourselves correct, but if you want a secure investment that has shown nothing but an increase in value for over three decades, get a classic Mercedes Benz and have it restored at Passarelli Restorations. 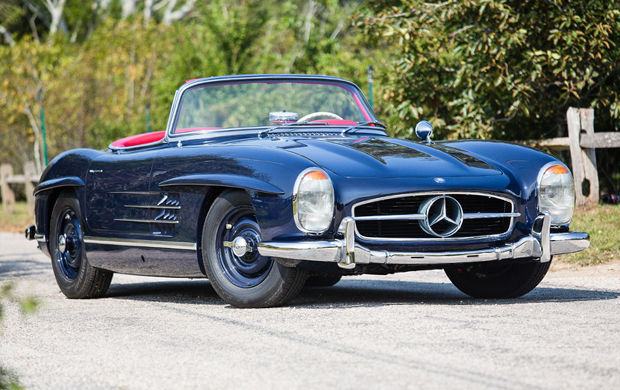 The premiere auctions at Scottsdale this year proved once again that Mercedes Benz are consistently setting new auction records. And, as we have been predicting, the “lesser” roadsters – the 190SL and the 280SL – are stepping into the price range where once you could acquire a 300SL. Yes, those wonderful roadsters are much more abundant that their 300 brethren, but there are many more collectors of our favorite marque than there were just a decade ago. It should be pointed out that a number of folks at the auction commented to us that the lesser priced 300SL roadster and the Gullwing could use restoration (we didn’t have a chance for a thorough examination so we won’t comment.) However, the important takeaways are the 280SL and 190SL numbers. We can still find you these cars at very reasonable prices. If you would like to have one at next year’s auctions, contact us now! We will close with this bit of information for you to consider. 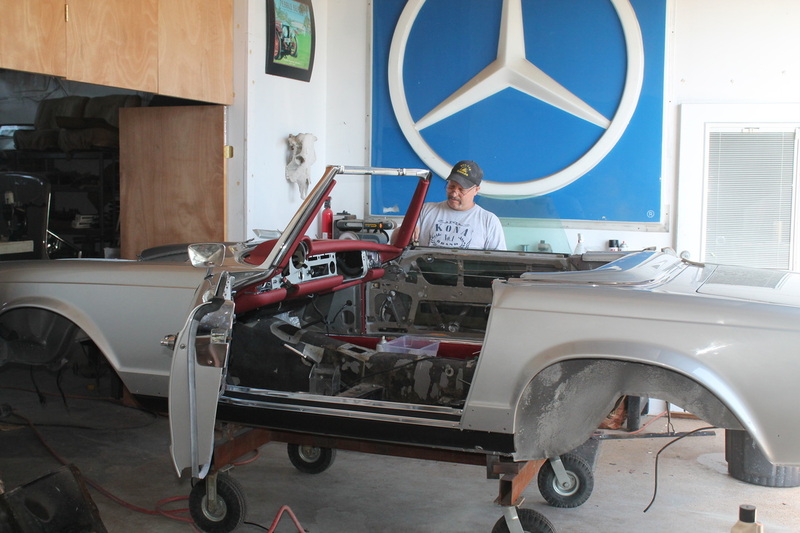 Virtually every client of Passarelli Restorations for nearly three decades has seen either a significant profit at sale, or an increase in the equity, of every classic Mercedes Benz that we have restored. Some of clients measure this profit in the mid-six figures! 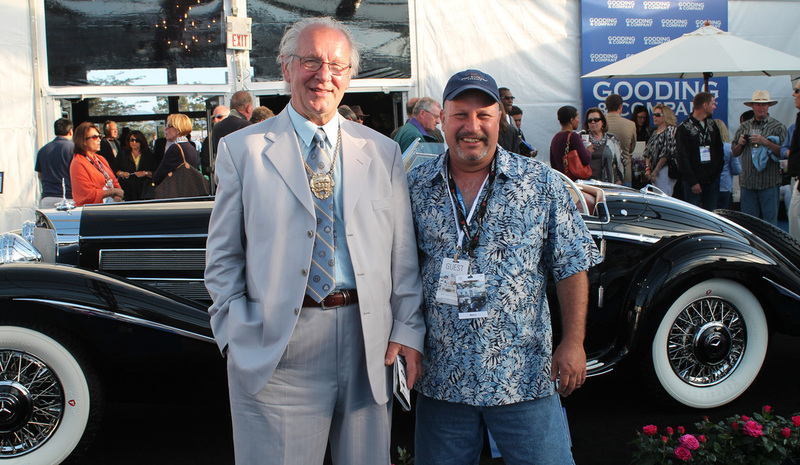 In the photo above, Mark Passarelli (right) and Pebble Beach Concours judge Seigfried Linke stand in front of a 1936 Mercedes Benz 540K Special Roadster. It was difficult for them to face away from this remarkable car as they admired the design and engineering of this rolling work of art. The amount that this beautiful example of automotive engineering and design brought on the auction block further bolsters the stature of the Mercedes Benz marque as a solid investment in a collector's portfolio. This car brought nearly $12 million on the Gooding & Company auction block, setting two world records for both a Mercedes Benz at auction and a pre-war car. Importantly for clients of Passarelli Restorations, another of our projects again set a world record (our second! ), this time for a 280SE that was the prototype car at the Brussels auto show. 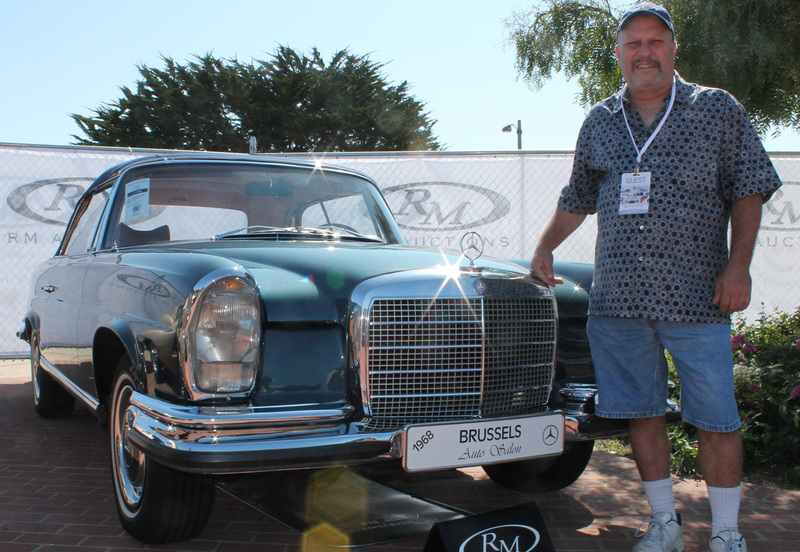 This car was the first 280SE to break the $200,000 mark at the RM Auction on August 18th. The restoration was completed in 1999 and, as is a hallmark of Passarelli work, required nothing more than regular maintenance to remain at a concours level after more than a decade. As Passarelli has predicted, Gullwings now seem firmly entrenched at the $1 million and above price point for a well kept car. A beautiful black Gullwing brought just under $1.2 million. 300SL Roadsters are keeping pace with their winged brethren, consistently in the $800,000+ range. As the 300SL cars continue their increase in value, the "little brothers", 190SL and 280SL cars, are seeing an increase, making them a solid investment vehicle. RM saw a 280SL that had been restored by Siegfried Linke (shown in the photo with Mark Passarelli and the 540K above), surpass the $100,000 mark. Mark's prediction of more 300 SLs surpassing the million dollar mark in 2012 came true in late January. 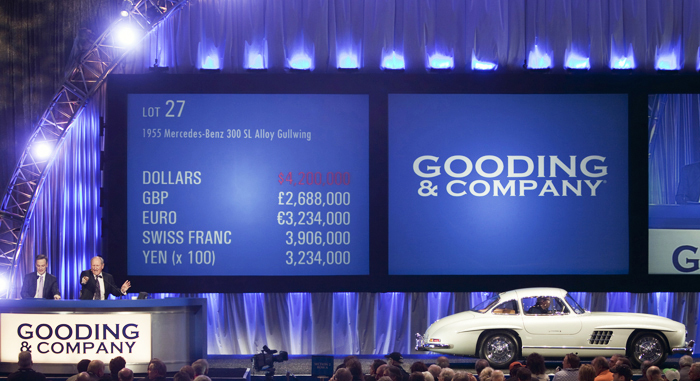 The Gooding auction in Scottsdale saw two Gullwings cross the block in excess of $2 million. One was the rare alloy body version that sold for $4.2 million. Consider that the alloy body was a $500 option if you ordered it in 1955!